Optimum Nutrition 100% Gold Standard Whey is made from the purest and most natural whey protein source that exists. It delivers 24 grams of muscle-building protein per serving, with minimal fat, cholesterol, lactose. If you are looking for Whey Protein Isolate (WPI) as the first ingredient on the label then Optimum Nutrition Gold Standard 100% Whey is the product for you. Whey Protein comes in a number of forms but the purest and most valuable is Whey Protein Isolate. Manufactured in a natural microfiltration process that does not damage the protein, Whey Protein Isolate is 90% protein and has virtually all the fat, lactose, cholesterol and other none nutritive substances removed. 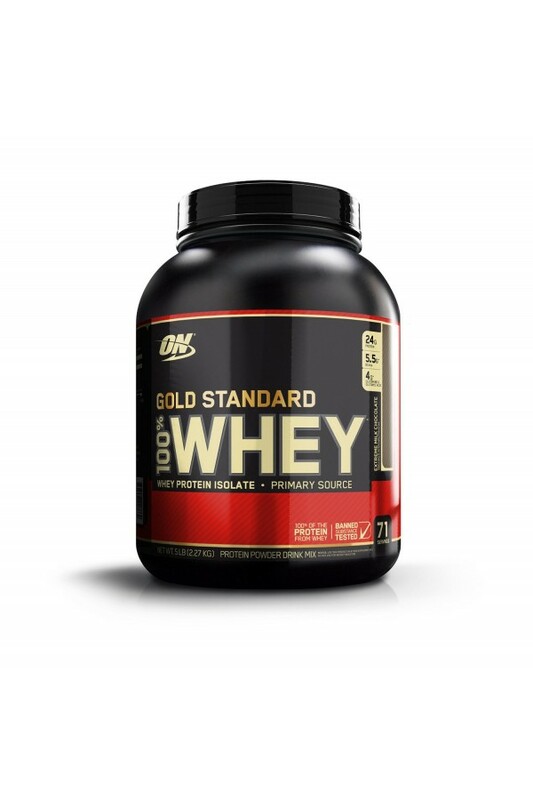 Optimum Nutrition 100% Gold Standard Whey uses Whey Protein Isolate as its largest protein source and will deliver 24g/serving of the most powerful protein you can find. Gold Standard Whey is instantized so it mixes like a dream with water or skim milk in a shaker or even with a fork in a glass. Add a scoop with your oatmeal, yogurt, muffins, or pancake recipes. Protein Digestibility Amino Acid Score (PDCAAS) is the gold standard in evaluating proteins and endorsed by the WHO and the U.S Food and Drug Administration. Whey Protein scores higher than any other protein on a PDCASS score. Protein Efficiency Ratio (PER) again Whey Protein beats all other protein sources. Optimum Nutrition Gold Standard 100% Whey is only made from the purest most natural sources of whey protein. Are All Whey Proteins The Same? Unquestionably not. Gold Standard Whey is made firstly from Whey Protein Isolate (WPI). Many Whey Proteins are made from lower value Whey Protein Concentrates and even very low grade Whey Protein Powder. These deliver significantly lower protein per serving and will inevitably contain higher levels of lactose and fat. Secondly the heat treatment is a critical element of the whey protein process. Too much heat treatment denatures the protein and damages its nutritional value. With Gold Standard 100% Whey you get Whey Protein Isolate (WPI) blended with Whey Protein Concentrate 80 (WPC80). What’s in ON Gold Standard 100% Whey? Gold Standard 100% Whey is fast absorbing so is best enjoyed first thing in the morning and/or during the 30 minutes just before or immediately after training. Simply mix one rounded scoop with 6-8 oz (180-240 ml) of your favourite beverage in a shaker cup.